Height 5' 10", Weight 170 lb. Ivon (or Ivan) Howard was born October 12, 1882 in Kenney, Illinois. He made his major league debut with the St. Louis Browns of the American League on April 25, 1914. He hit .209 in 18 games for the Browns that year, and in 1915 hit .324 in 113 games. The next two seasons he played for Cleveland, hitting .246 in 81 games in 1916. A switch hitter and utility player, he fielded all infield positions except shortstop. 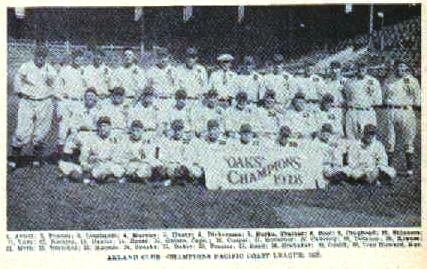 In 1916, his older brother Del took over as manager of the Oakland Oaks in the PCL. 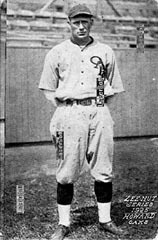 Ivan succeeded Del as manager of the Oaks in 1923, and continued in the job until 1929, the longest tenure of any manager in the history of the franchise. In 1927, under his leadership, the team set a 14 game winning streak record and won their first Pacific Coast League pennant in fifteen years. It would be another long 21 years before the flag would come back to Oakland again. Visit The Oakland Oaks webpage. (c) Copyright William B. Shubb, 2002.